This month's Daring Bakers Challenge filled me with excitement the second it was posted. 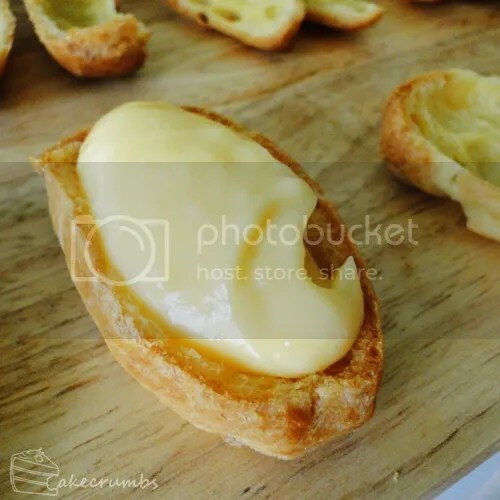 Kat of The Bobwhites was our August 2012 Daring Baker hostess who inspired us to have fun in creating pâté à choux shapes, filled with crème pâtissiére or Chantilly cream. 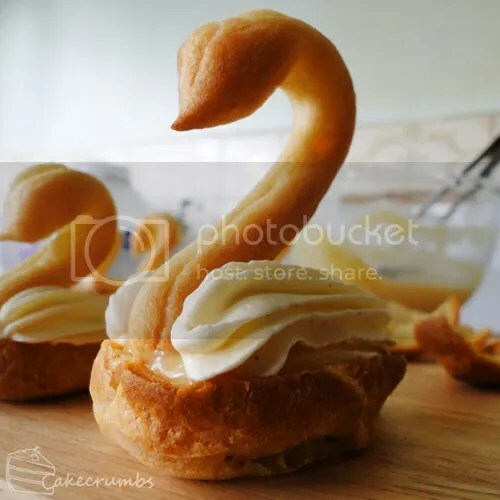 We were encouraged to create swans or any shape we wanted and to go crazy with filling flavors allowing our creativity to go wild! For me, there was no choice other than swans. I have been wanting to make these for a while but never found the excuse. What a perfect excuse this was. These are a lot easier to construct than you may think. 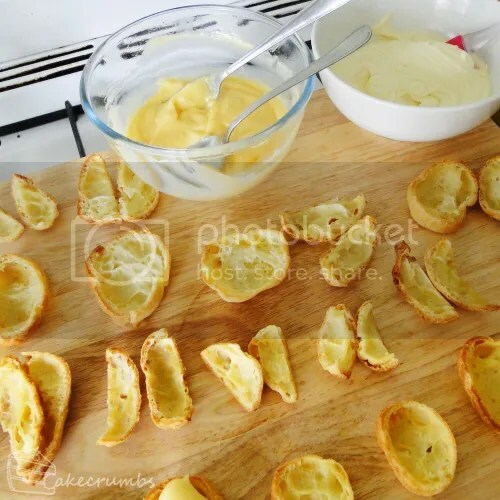 First, you bake the choux. I piped the swan necks and bodies, then used wet hands to shape some tails and beaks on them. Then all you have to do is slice the bodies lengthways, then chop the tops in half. Just like making butterfly cupcakes. I filled the bases with vanilla crème pâtissiére. Then I stuck the necks on and piped some vanilla Chantilly cream to give the wings a bit of volume. I made the cream with a little vanilla bean paste to make it extra special. Then all you have to do is place the wings on top and you have yourself a lovely swan. I served these guys on plates of blueberry jelly to give them a little pond to swim in. The shiny surface of the jelly also gave the swans a life-like reflection on the surface of the "water". But of course I had to take things one step further. I made some white and black swans to pay tribute to one of my favourite ballets (Swan Lake) as well as my favourite ballet movie (Black Swan). Black swans (Cygnus atratus) was also the very first species I studied as an undergraduate Zoologist, so either way they were definitely going to make an apperance. 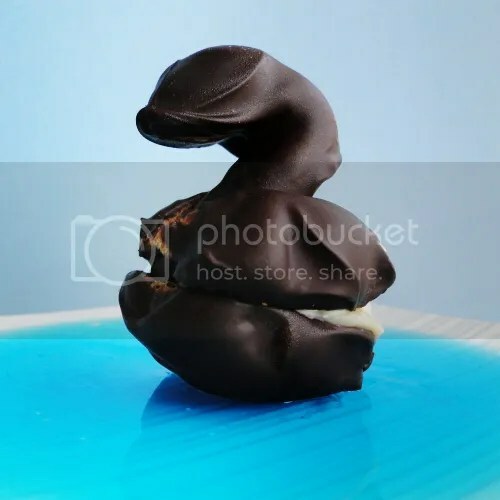 These are made the same way as the above swans, only I dipped them in chocolate before assembly. As I neared the end of the batch and the chocolate began to set and thicken, I ended up with some pretty cool patterns. I gave the batch of swans to my sister to take to her teaching placement. They were a total hit. I'm sure she made some new friends very quickly. 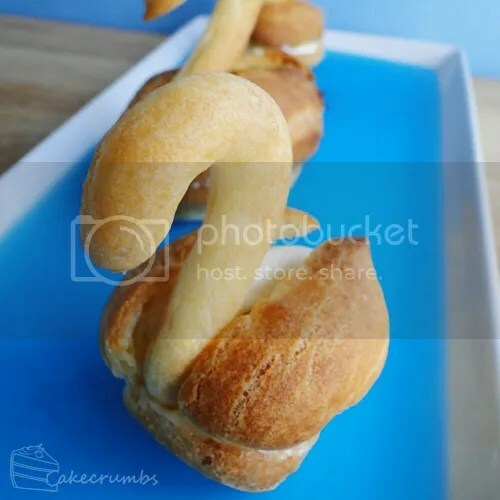 Here's how you can make your own flock of delicious swans. Combine butter, water and salt in a small saucepan; stir over medium heat until butter melts, then bring to the boil. Remove from heat; add all the flour at once and beat using a wooden spoon until mixture pulls away from the sides of the saucepan and forms a smooth ball of dough. Add eggs, one at a time, and beat well after each addition (electric mixer may be used, but be warned it gets sticky!). If mixture is too dry, beat in an additional egg. Mixture should thick, smooth and glossy. 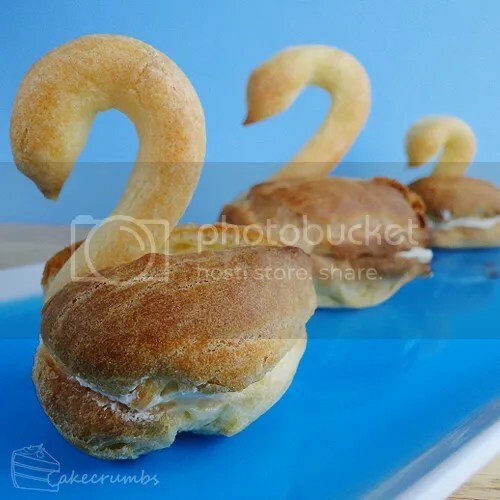 If making the swans, put 1/3 of the mixture into a piping bag fitted with a 6mm round tip. Pipe out the swan heads and necks (you're aiming for a number 2 shape). Remove the piping tip and pipe the swan bodies. Bodies should be 4-5cm long. Bake until deeply golden and puffy. Baking time will depend on size. The heads will bake in around 15-20 minutes. The bodies will take between 30 minutes to 50, depending on size. For 4cm puffs, you're looking at about 45 minutes. When puffs are done, split to release steam and allow to cool in the (turned off) oven with the door slightly ajar. This will preserve the crispiness. When cool, slice and assemble as above. Make sure you have measured out all your ingredients before beginning this recipe: you will need them all on hand immediately. Dissolve cornflour in 1/4 cup of the milk. Combine the rest of the milk with sugar in a medium saucepan; stir over medium heat until sugar dissolves, then bring to the boil. Remove from heat and set aside. In a large bowl, beat the whole egg into the cornflour/milk mixture, then beat in the yolks one at a time. Pour 1/3 of the boiled milk into the egg mixture, whisking constantly to avoid the eggs cooking. Return the remaining milk in the saucepan to the boil. Whisk; pour the hot egg mixture in a continuous stream into the saucepan, still whisking continuously. Keep whisking until the mixture thickens and boils. This will happen quite rapidly so keep an eye on it and keep whisking the whole time, or else the eggs will scramble. Once mixture has thickened, remove from heat; beat in butter and vanilla. Transfer to a clean, grease-free bowl. Cover with plastic wrap to stop a skin from forming and allow to cool to room temperature. refrigerate if not using immediately. Thank you! She was definitely chuffed when I said they were all hers haha. Thank you. 😀 The chocolate coated ones were the first to go! Thank you. 😀 They were lots of fun. These look great at every step of the process. Even without the pastry wings put back on, they would have looked great. I never saw these (in person) with the jelly, but that was very inventive too. Nice job! You got some great shapes out of the pastry. Eventually! Haha. I’m only disappointed I didn’t have them ready for when you were over. They were still very impressive when I saw/had them. And I’ve seen the final result in the photos. 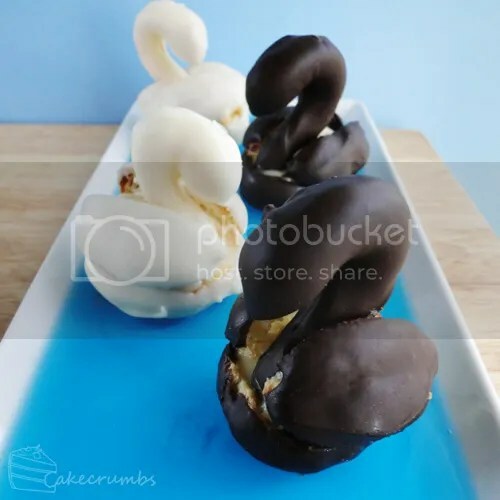 Oh my gosh, you went all out – vanilla bean paste in the filling sounds amazing and the chocolate dipped swans look gorgeous. Really amazing work. Thank you. 😀 The vanilla bean paste definitely gave it an extra kick – it was hard to not eat the cream right out of the bowl! 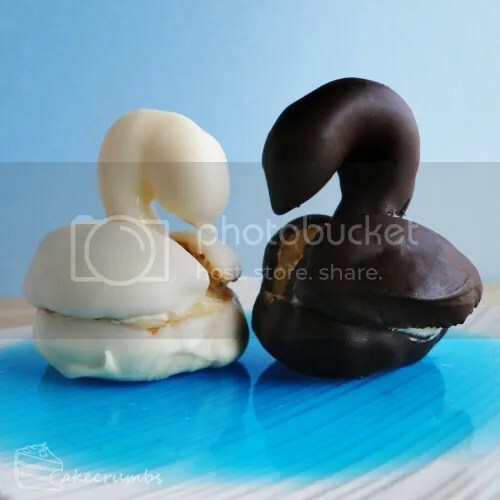 Wow, your swans are so beautiful, and the ones coated in chocolate are so inviting! Amazing job on the challenge! Great pics! Those patterns from the chocolate are beautiful. It’s like they have feathers. These certainly came out fantastic! Here’s to the next challenge! 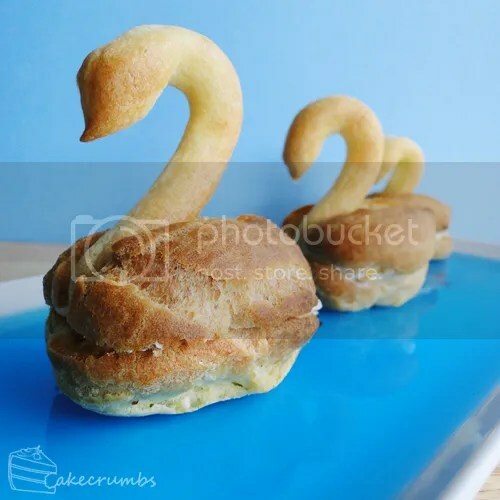 I love the idea of dipping the swans in chocolate (love that ballet too), I need to do that next time. 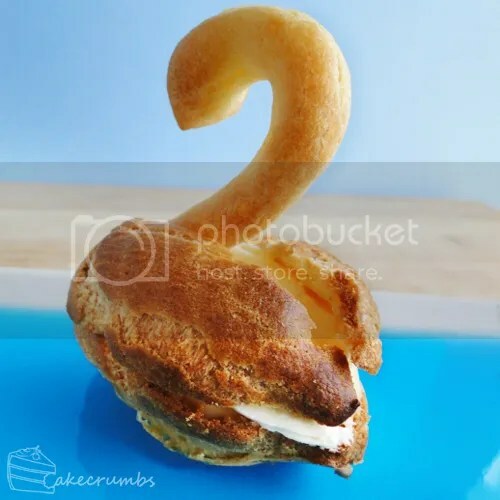 Putting chocolate on the swans…. GENIUS!